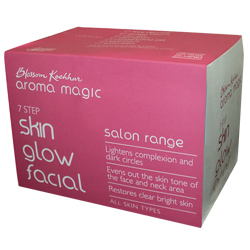 Aroma Magic Skin Glow Facial Kit Lighten complexion & dark circles, Restores clear bright skin. Lighten complexion and dark circles. The 7 step facial provides a quick, effective way to lighten complexion, under eye dark circles and even out the skin tone of the face and neck area. The natural ingredients gently remove the dead skin layers and restore clear, bright skin to your /your client?s face. Evens out of skin tone of the face and neck area.